Happy Saturday, everyone! I hope that this weekend day is finding you well! Well, today is the big day! 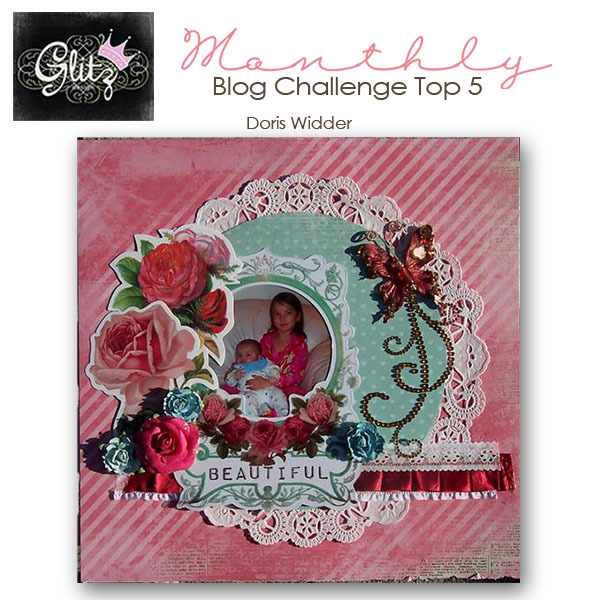 We are going to reveal the winner of our January Blog Challenge, and the Top 5!! So, without further ado....please congratulate our first 2012 Blog Challenge Winner!!!!! Marilyn's layout is SO pretty!! We love the fun banner that she created, and the Maypole accent is just super cute and sweet!! Congratulations Marilyn! Please send your shipping address to glitzdt@gmail.com, and I will get your information to our warehouse for shipment of your prize!! Marilyn's layout is also one of our Top 5, and here are the rest of the projects that caught round it out!! How beautiful is the cluster of flowers on Rachael's layout, and I love how she's cut the birds from a Glitz Design Whatnot! Awesome creation, Rachael!! Shona's layout caught our eye with all the amazing layers!! She did a wonderful job fussy cutting those yellow flowers from some Vintage Blue paper, and the doily is such a great addition!! Amazing job, Shona! Doris's Beatiful Dreamer layout is just that....beautiful!! I love how she used the gorgeous Whatnots, and matted the Polka paper on that gorgeous doily!! So so pretty, Doris!! 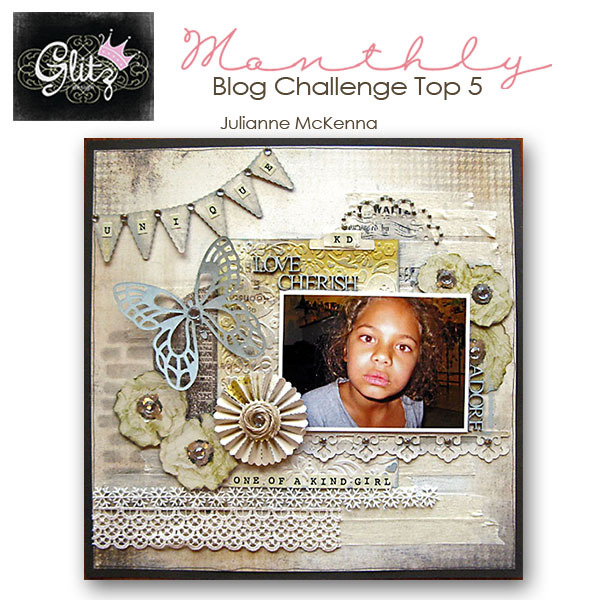 Julianne has so much amazing texture on her layout, and that really stood out to me! I love the trims at the bottom, and the accordion flower is a perfect touch! The fussy cut flowers are a great addition too! Lovely job, Julianne! Well, there you have it! Our first Top 5 of 2012. I wanted to say thank you to everyone who participated in our first blog challenge....all of your creations were amazing!! We hope that you will join us again in our February Blog Challenge, which will go live tomorrow!! Be sure to check back and see what it is!! Gorgeous layouts, everyone! Thank you so much for including my page in the top 5! I feel so honored!!! Congrats to the Winners... especially to my friend Marilyn.